A selection of more than 100 projects to make your workshop more productive and efficient. Making tools. accessories, and equipment for the home workshop. that will stay in the workshop. 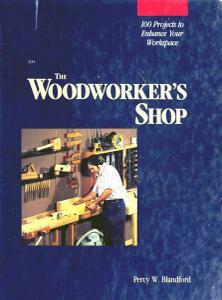 is the focus of Percy Blandford`s new book, The Woodworker's Shop: 100 Projects to Enhance Your Workspace. More than 100 projects are presented in all. each with step-by-step instructions. detailed drawings. and materials lists. Ranging in complexity to suit any degree of skill. all are designed to help you do your work faster. more economically. and with greater accuracy. Protects include benches and other work-surface enhancements holding devices and clamps storage containers and a variety of items that will enable you to obtain optimum performance from the lathe hand saw router drill circular saw plane jointer and other tools. All proieLts are designed to expand your workshop economically by extending the capabilities of the tools you already own. Whether the woodworking you do is a source of income or purely a source of pleasure and relaxation, your workspace influences the items you produce. Pick and choose among the many projects presented here to affordably customize your workshop to meet your needs and goals.